One day after Scotland Yard reported that they believe that they’ve found new evidence that may support the possibility that Madeleine McCann may still be alive and released an age enhanced photo of the missing toddler, Portuguese Police authorities have refused to re-open the Madeleine McCann stating that there is no new evidence to warrant the re-opening of the case. 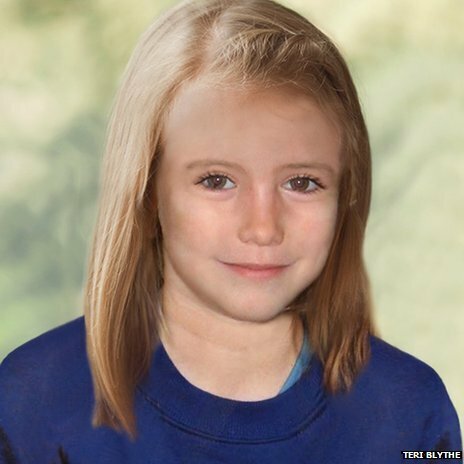 Portuguese police refuse to re-open investigation into Madeleine McCann's abduction case one day after U.K. police release this age enhanced composite photo of what Madeleine might look like today at the age of 9 years. While U.K. police have stated that they sent 30 police officers over to Portugal some seven times during the first investigation, it didn’t seem to have been enough effort on their part at the most crucial time in this case. Some nearly five years after her abduction, Madeleine could be anywhere at this point in time. In a case where there has been no body found and no evidence to prove that Madeleine is not alive, there still remains a hope for the parents that their child could still be alive and living somewhere with her abductors or others who may have been given the child. It’s a nightmare that will never go away until Kate and Gerry McCann either find their child, or find at least evidence that she is not alive. Portuguese police have been criticized for their investigative methods and skills or lack of them in this case and therefore, there are a lot of unanswered questions running rampant through people’s minds who have been following this case. While it is questionable why U.K. police and Scotland Yard have seemingly sat on their thumbs on this case for nearly five years, the Portuguese police forces have bungled a lot of the case and the parents have had to resort to hiring private investigators to by-pass both forces’ inept investigations. It can be hypothesized that U.K. police systems did not take as active a stance as they could have taken. Equally, many have criticized Portuguese police for having been as sloppy in their investigation. In the meanwhile, the question of what happened to Madeleine McCann is still looming large in not only the parents’ minds but, also that of the public who knew about and followed this case from Day 1. This also leaves both police forces’ investigations in question. One could speculate that U.K. police forces were pressured into what one might consider, publicity stunt to soothe the criticism that fell upon them over this case and therefore, there truly isn’t sufficient evidence to support another investigation. U.K. forces could also be thought to be doing nothing more than posturing by producing a tactic by which it takes the owness and heat off of them by passing the buck back to Portuguese police and let them refuse to re-open the case then, taking a “what can we do…we tried?” type of stance. It appears strange that some nearly five years after the little girl’s abduction, Scotland Yard and U.K. police have come forward with this seemingly sudden form of enthusiasm, kind of like The Calvary, with guns drawn and heading off half-cocked with a sudden and bold statement that Madeleine may still be alive and handing out age enhanced photos to the media. It wreaks of a publicity stunt, designed to save face in an international, heart-tugging and well publicized case. Meanwhile, Portuguese police’s refusal to re-open the case, appears to also be saving face. The question is from what? Are they afraid that their less than stellar investigative procedures in this case will fall upon international scrutiny? What are they afraid of happening should the case be re-opened? Perhaps, a more key question should be, what do Portuguese police have to lose by re-opening this case? As it sits right now, neither set of forces have a star beside their names in this case. Both have been less than brilliant in how this case was handled from the beginning and most crucial portions of it and has left both forces open to scrutiny was well as criticisms world wide. What would it hurt for Portuguese police to allow this case to be re-opened, every “new” piece of evidence that U.K. police claim to have only now found, be investigated thoroughly, either ruling each piece in or ruling each piece out? Either way, both would stand to save face by re-opening the case under what U.K. police have alleged that they have found. That is, unless, of course, Portuguese police have something to hide about this investigation and their techniques. In spite of the many questions that can be raised, the fact remains that there’s a little girl who went missing and has not been found. That leaves the question in many people’s minds of where she is. Is it right to leave those questions hanging in the air without answers one way or another? Do the parents not deserve some form of closure no matter what the end resulting answer is? It’s only my own personal opinion but, I suspect that if enough pressure is placed upon the Portuguese police force and perhaps, the Portuguese government, this case will be re-opened at some point in the near future. Let’s hope that some sort of resolution can be found so that the question of what happened to Madeleine McCann can be answered. Jessica Simpson Into Fourth Trimester and Still Not Given Birth?